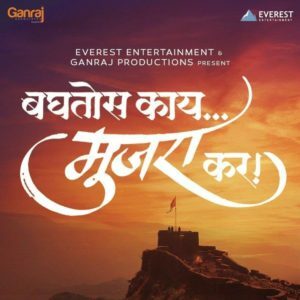 ‘Baghtos Kay.. Mujra Kar !’ one of the finest movies of Marathi is soon going to be aired on Sony Marathi as World Television Premier on 14th October. 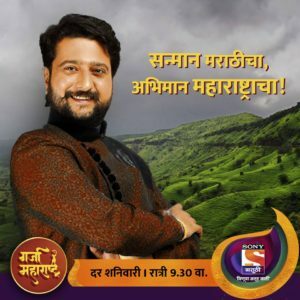 Well known actor Jitendra Joshi who is starring in the film is also anchoring Sony Marathi’s show Garja Maharashtra. 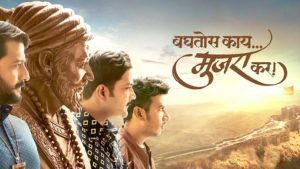 Here in this show Jitendra Joshi presents the stories of great legends of Maharashtra. Baghtos Kay.. Mujra Kar ! is also speaks on such topic. Jitendra Joshi is known to play his characters with sheer dedication and impact. He gives a complete justice to his character; it can be seen in this film as well. Maharashtra’s idol Chhatrapati Shivaji Maharaj is the pride of Maharashtra and his forts are as precious as him. But unfortunately recently it’s seen that these monuments are not being kept in very good condition. Today’s youth needs to be more aware and carefully responsible about this. Baghtos Kay.. Mujra Kar ! points out exactly this point. It’s a story of Shivaji Maharaj’s 3 Mavlas Nanasaheb, Pandurang and Shivraj. They are from Kharbujewadi. On this 14th October on the occasion of this World Television Premier this journey can be relived. Director Hemant Dhome says – “if at least half the budget can be used for conserving these forts then the film is worth and we will be honored”. Jitendra Joshi is praising Shivaji Maharaj in this film. Not only this but he also tells great stories of Maharashtra’s legends in his show Garja Maharashtra on Sony Marathi. Until now he has presented the stories of saint Tukaram, saint Dnyaneshwar, Chhatrapati Shivaji Maharaj, Bajiprabhu Deshpande and Mahatma Phule. In upcoming episodes he will be presenting the stories of more legends like Gopal Ganesh Aagarkar, Dr. Rakhumabai Raut and many more. For all these mesmerizing experiences and to watch Jitendra Joshi’s different shades keep watching Garja Maharashtra and enjoy the World Television Premier of Baghtos Kay.. Mujra Kar ! only on Sony Marathi on 14th October 2018. Previous articleIs Reena Aggarwal PNG Gadgil’s New Brand Ambassador After Madhuri Dixit?